Concept. 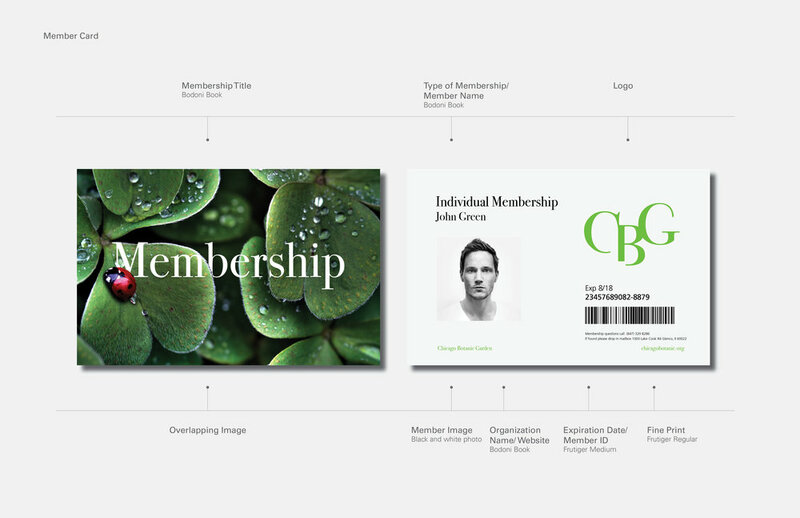 An identity system that reflects the Chicago Botanic Garden's mission and current goals to its visitors and contributing members. Inspired by themes of growth from the plants and the Garden’s "Keep Growing" 10-year plan. The logo imitates the growth of plants. For the posters, business cards, and other stationery the text acts as a vine weaving through the image. Chicago Botanic Garden launched a 10-year plan appropriately titled "Keep Growing". The plan details the Garden's commitment to grow and mature as a leader in botanic research, education, and collection. Green is the color of earth and nature, it is also a color associated with advancement and growth. Bodoni was chosen as the primary typeface. Its variation in stroke weight resembles a thin-to-thick pattern that is seen in plants and trees. 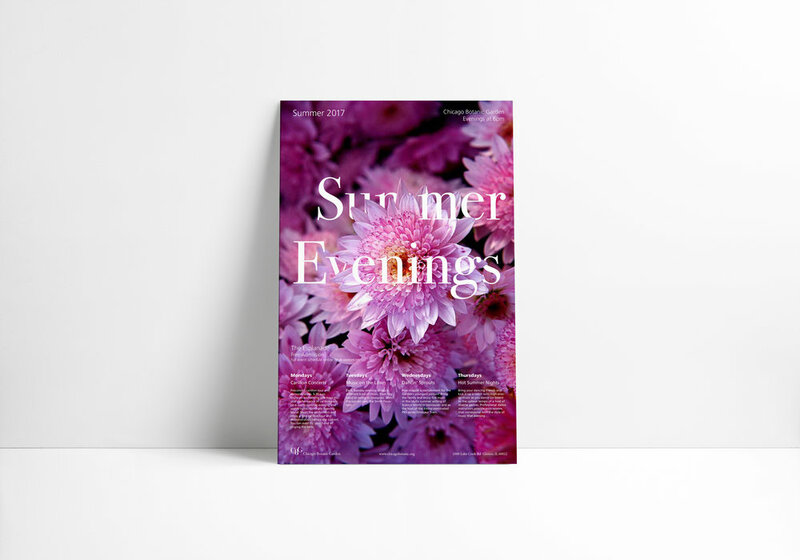 Frutiger compliments the elegance of Bodoni with its clean lines and soft curves. It serves a dual purpose for being an easily legible typeface at a small point size. 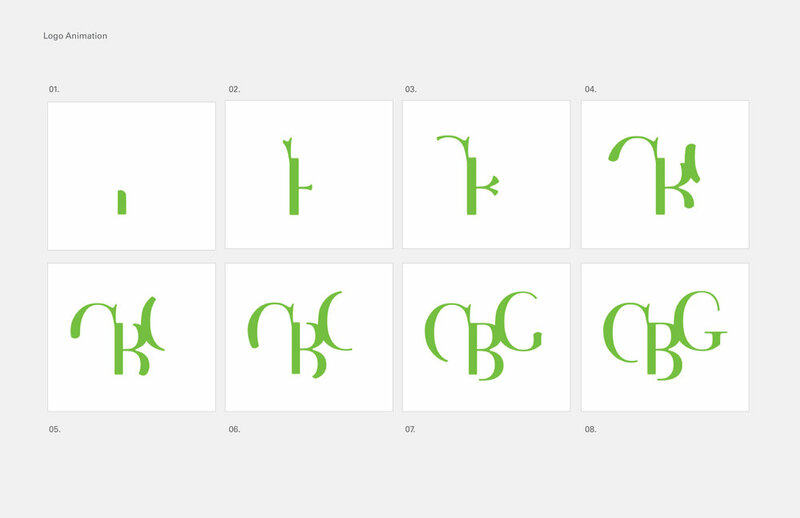 The logotype stems from one single point and branches out. 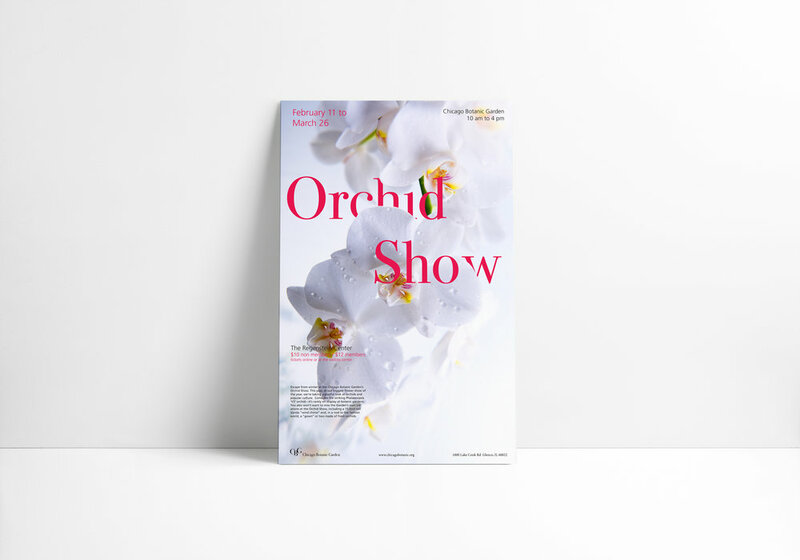 The letterforms create a custom plant structure reading CBG. The logo animation reinforces the themes of growth. Here the logotype acts as a plant growing outwards from the perspective above soil level. CBG has three main sectors of employment: research, garden, and education. 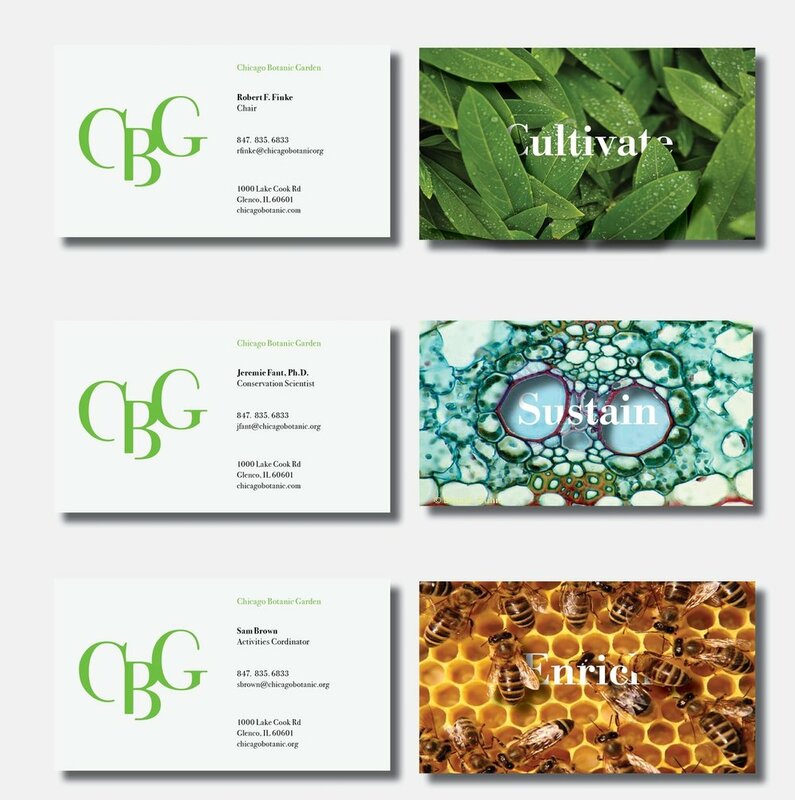 A keyword from CBG's mission statement was allocated to each sector and paired with an appropriate image to create a custom business card that reflects the values within each department. The keyword weaves through the image. A customized security envelope for mailing sensitive information to members and employees. The texture in the interior of the envelope was created using the logotype. When opened, the texture becomes a pleasant bed of foliage. The texture inspired by the foliage pattern leaves and vines create. 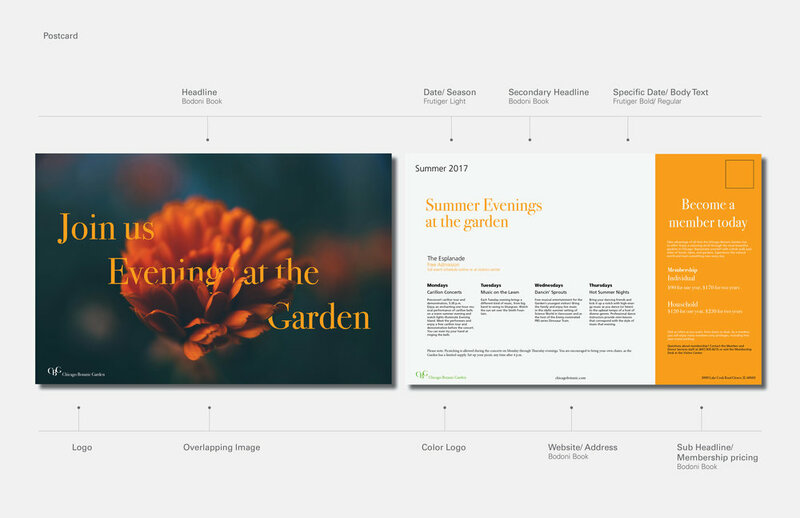 The letterhead, security envelope, and personalized business card cultivate themes of growth that are reflected through out the garden. 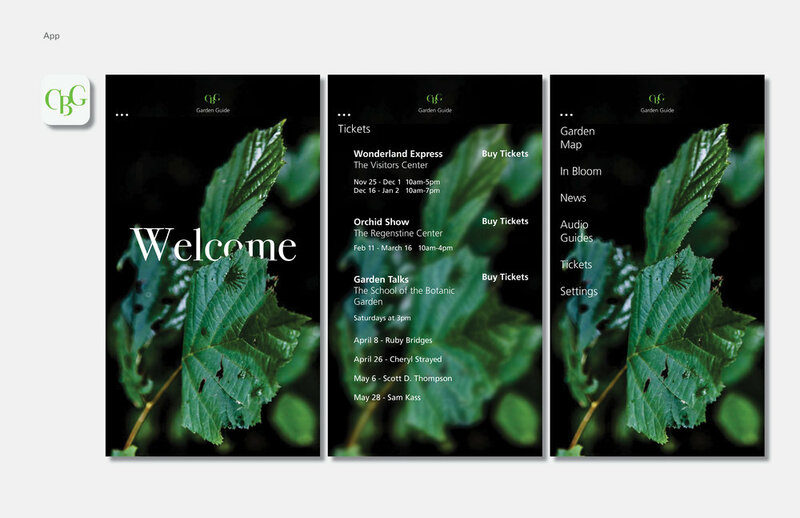 An updated version of the current app allows users to purchase tickets to upcoming events and exclusive exhibitions.